The aim of this study was to determine whether the outcomes of patients with hemodynamically unstable pelvic bone fractures changed after the introduction of a protocol including extraperitoneal pelvic packing (EPP) and the establishment of a trauma center. We analyzed data of adult patients (≥ 18 years old) with hemodynamically unstable pelvic bone fractures who visited a single trauma center from February 2009 to October 2016. In July 2014, a new protocol for pelvic fractures was implemented, and a trauma center was established. Therefore, patient outcomes were compared by period (period I: pre-protocol vs. period II: post-protocol). Seventy-nine patients with hemodynamically unstable pelvic bone fractures were recruited. The time to angiographic embolization after arrival at the emergency room decreased significantly in period II when compared to period I (182.9 vs. 268.9 min, respectively, p < 0.001). The time required to intervention, including EPP, also decreased, from 268.9 ± 132.4 min in period I to 141.9 ± 79.9 min in period II (p < 0.001). The overall mortality rate decreased from 47.2% in period I to 23.3% in period II (p = 0.033), and mortality related to hemorrhagic shock in particular, was significantly lowered, from 27.8% in period I to 4.7% in period II (p = 0.009). 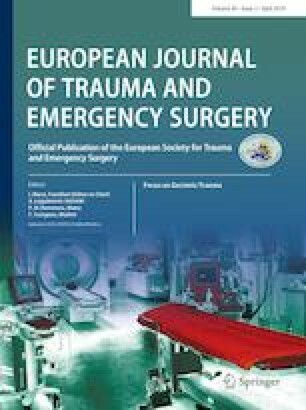 The establishment of a trauma center and the implementation of a new protocol that included EPP were effective in the treatment of patients with hemodynamically unstable pelvic fractures. Min A. Lee, Byungchul Yu, Jungnam Lee, Jae Jeong Park, Gil Jae Lee, Kang Kook Choi, Youngeun Park, Jihun Gwak and Ahram Han declare that there are no conflicts of interest. Informed consent obtained from subjects. There are no sources of funding in our study. The work has been approved by the appropriate ethical committees related to the institution in which it was performed.